North Inlet Trail – Grand Lake, Rocky Mountain National Park. Yes, that is a moose! The Disappointment Cleaver Route – Mt Rainier, Washington. Nearing the summit of my most technical climb to date. 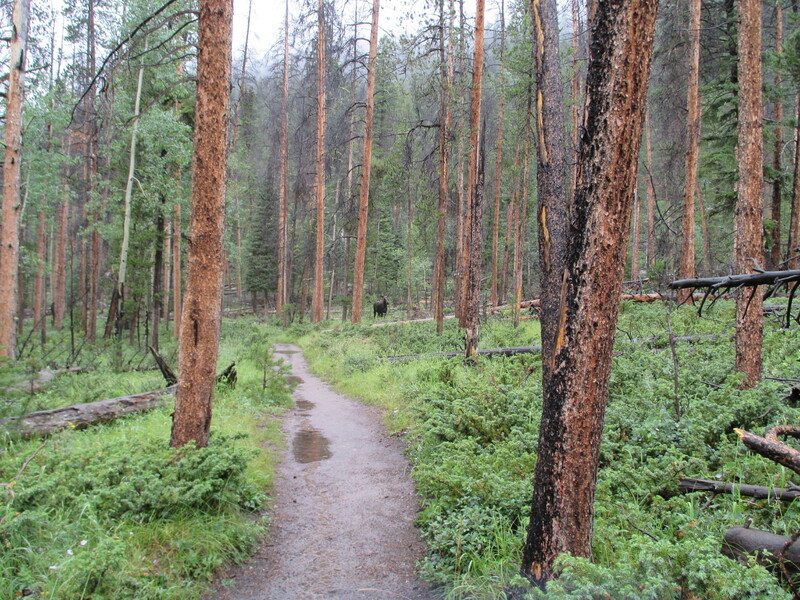 Barr Trail – Pikes Peak. The Pikes Peak Marathon is my favorite race every year. 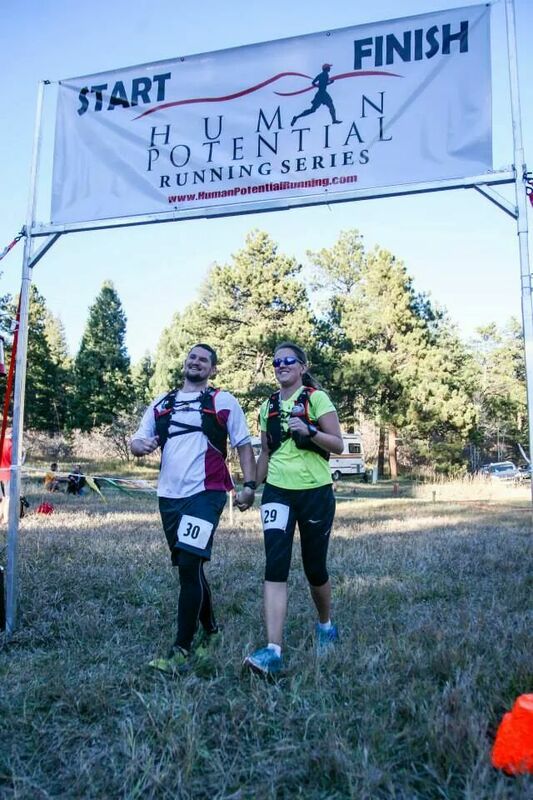 Mile 14 of “Run the Rut” 50K – Big Sky, Montana. Yes, those are people rappelling. During a race. 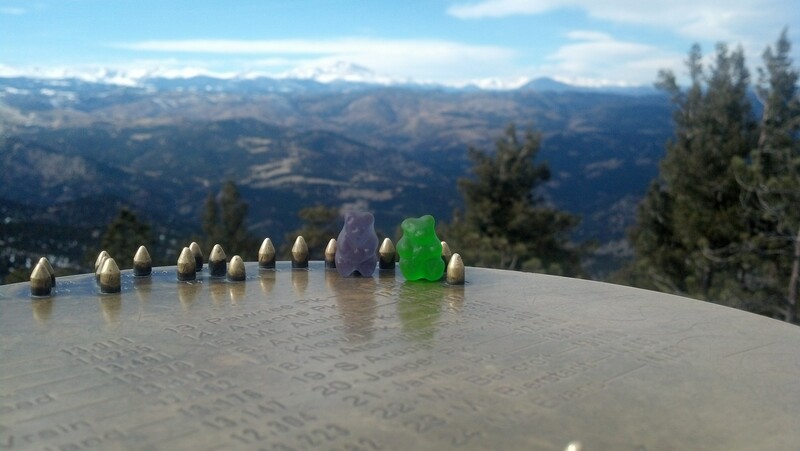 Green Mountain Summit – Boulder. Two of my favorite things – Green Mountain, my local go-to for a quick, steep climb, and gummy bears, my go-to trail snack. Barr Trail – Pikes Peak. 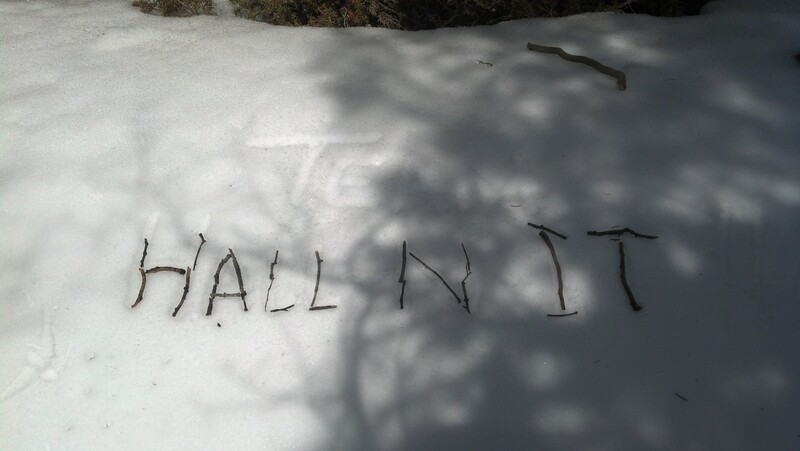 “Team Hall ‘N It,” a motivational message left from one of my favorite running partners. 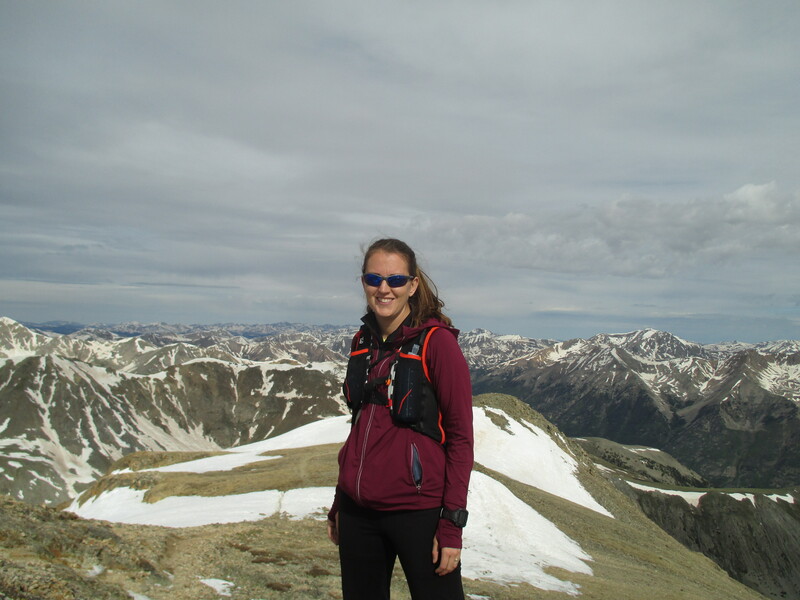 Mt Elbert Summit – 14,433′. 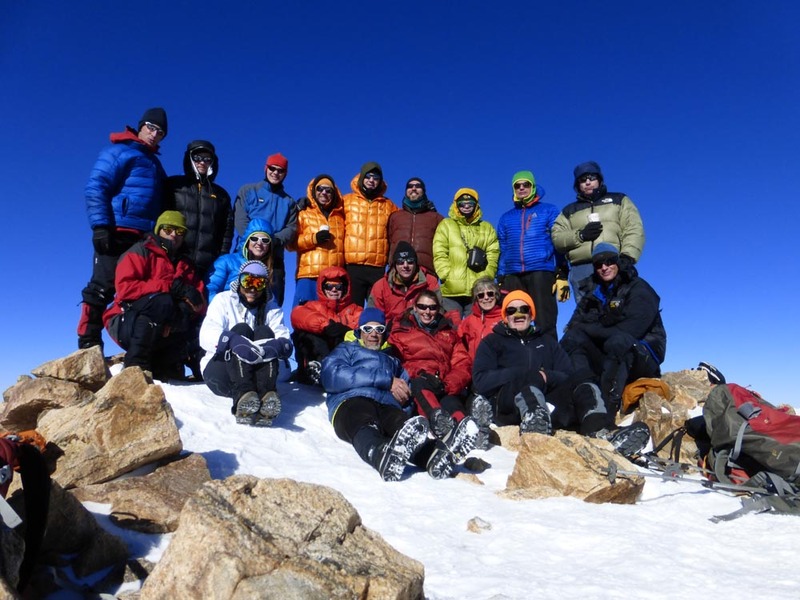 My favorite 2014 summit, a celebration of Sarah Meiser who became the fifth mountaineer – and the first woman – to climb all 58 Colorado “Fourteeners” in calendar winter. The other mountaineers/ultra-runners in this picture are phenomenal; I was lucky to be a part of their celebration. 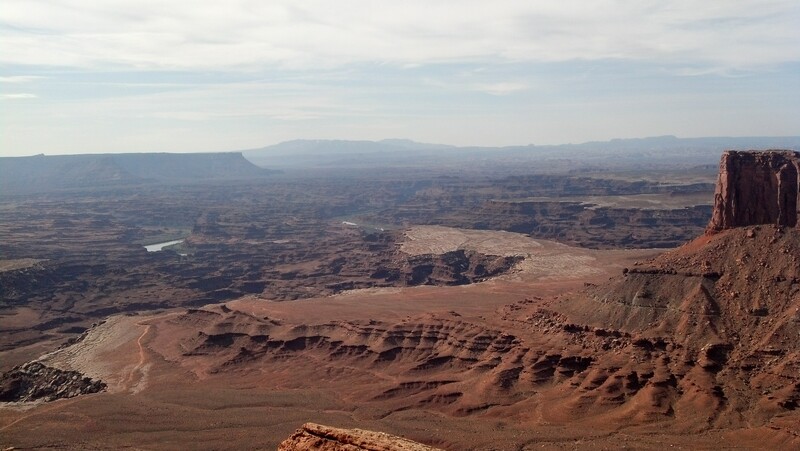 Island in the Sky – Canyonlands, Utah. A solo trail run to celebrate my 31st birthday. 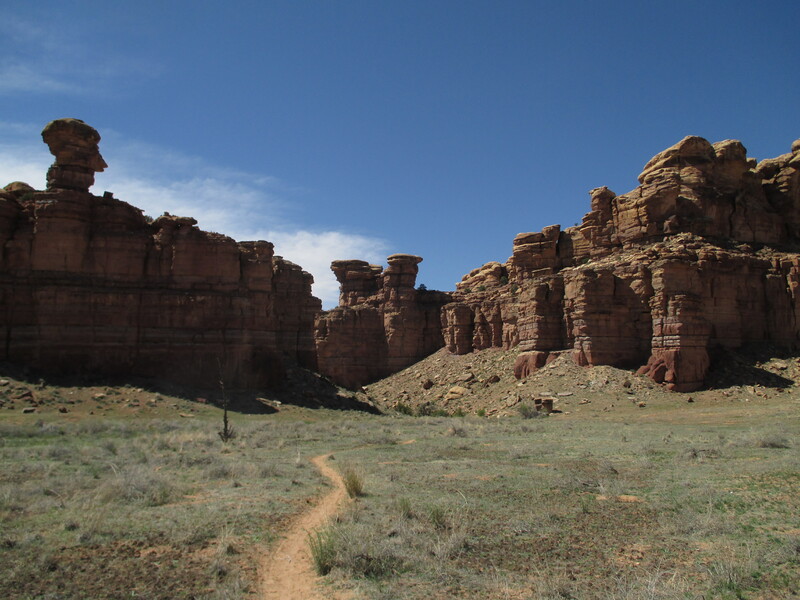 The Needles – Canyonlands, Utah. A solo trail run to celebrate my 31st birthday. 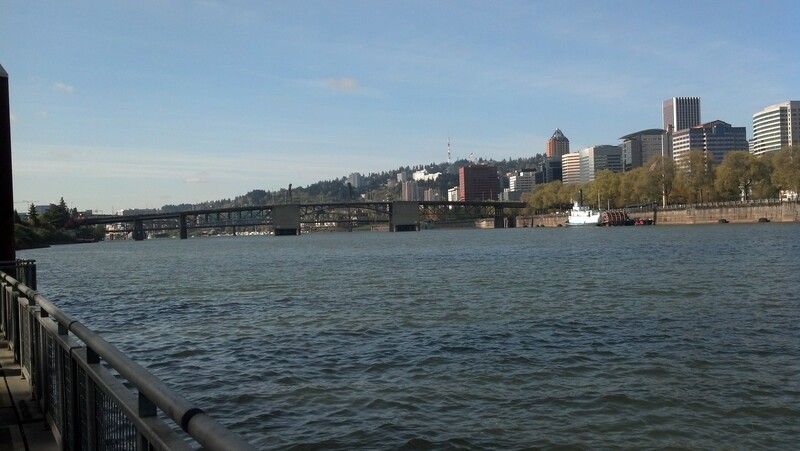 Downtown foot paths – Portland, Oregon. Living in the Colorado desert, all this water fascinated me! We ran over about 906 bridges. “Dirty 30” 50K – Golden Gate State Park. A view of a snow Mt Evans from mile 16ish. Mt. 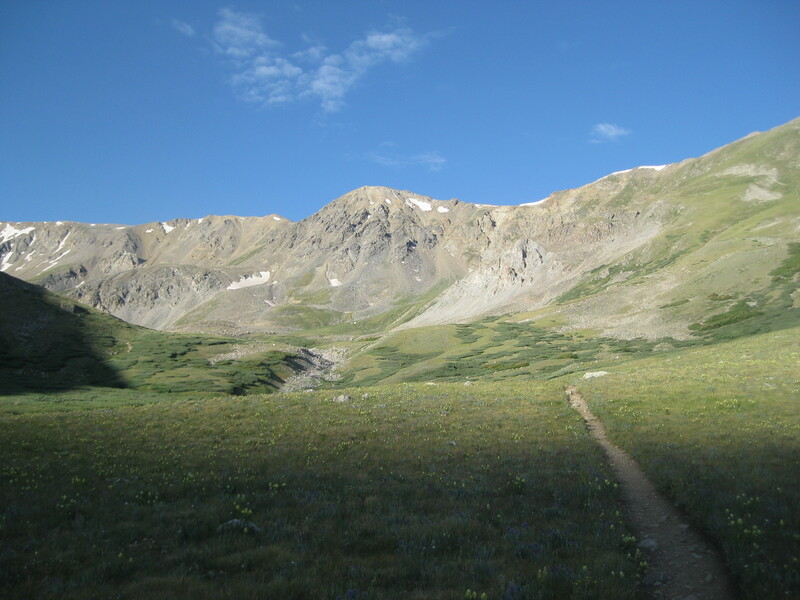 Belford – Oxford Saddle – 14,153′. My third trip up these beasts. Mt Evans Road – 14,264′. 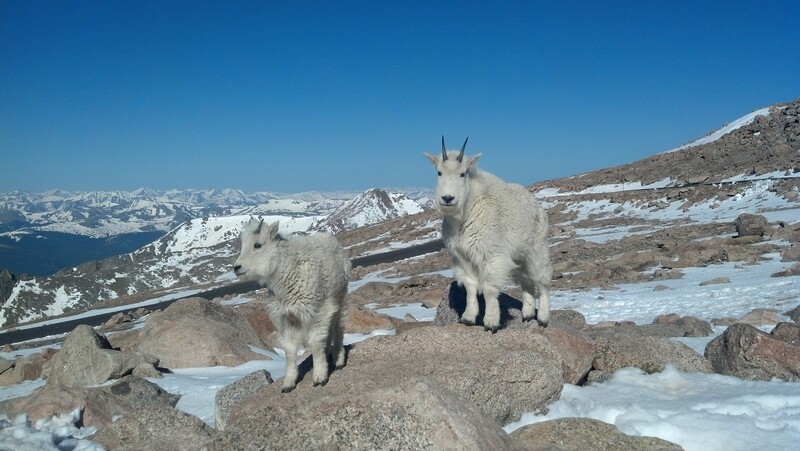 Every year the mountain goats help me train for the Mt Evans Ascent foot race. 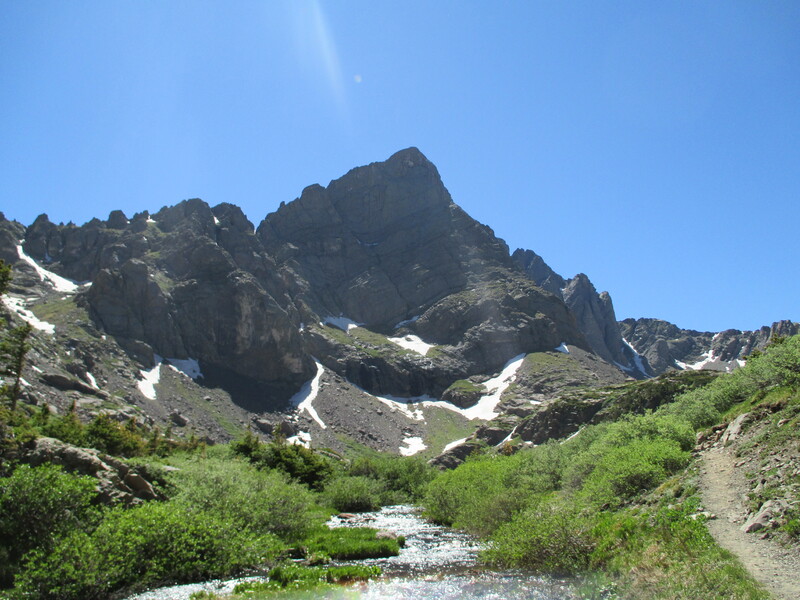 Crestone Needle – South Colony Lakes. My favorite Colorado basin. 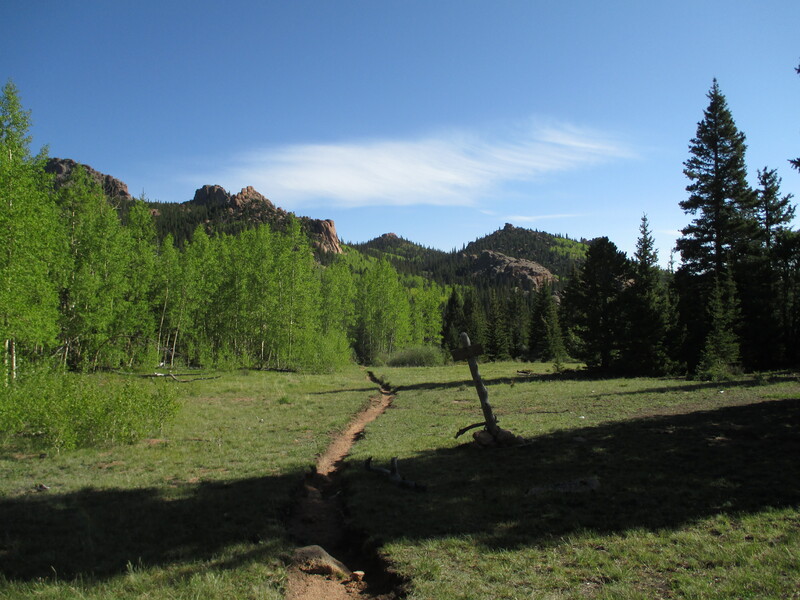 Lake Park Trail – Lost Creek Wilderness. My first run through this wilderness. I have no idea why this area is yet to gain popularity with Denver/Boulder-ites. 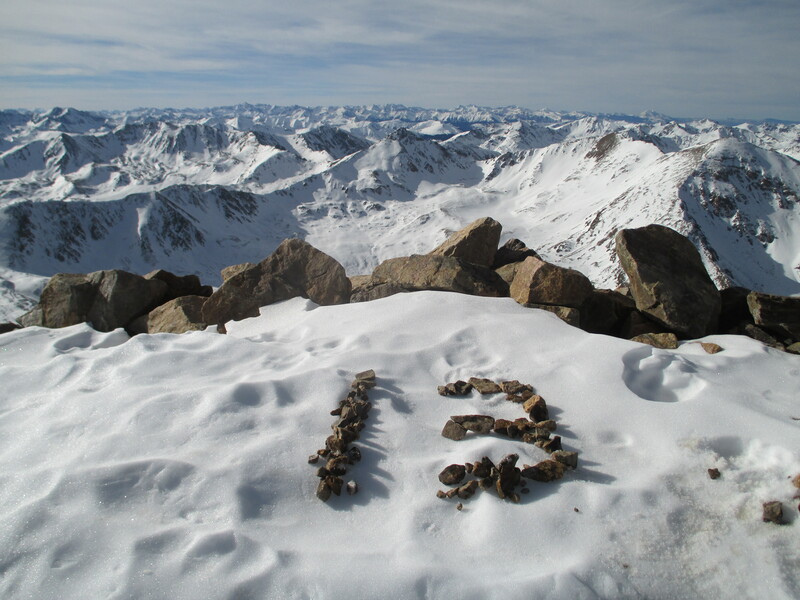 Mt Democrat – 14,148′. Watching the sun rise as I climb. The finish line of the Medtronic Twin Cities Marathon – St. Paul, Minnesota. Best for last: My favorite moment of 2014, a celebration with my Medtronic bionic family. I’m wishing a year full of blessing for you in 2015, on the trail and off. Yesterday I celebrated my headache’s thirteenth birthday. On December 15th 2001, I was an eighteen-year-old Air Force Academy cadet when I contracted meningitis, the inception of my chronic pain. I mean it when I use that word, celebrate. At least I mean it today. Earlier this year I wrote about perpetual loss, how as someone with chronic pain, I find that I have to continuously acknowledge and grieve new losses because the condition is on-going, not an event in the past. The flipside is that I also find the need for perpetual, ongoing acceptance. Every day I try to find peace with what is. Just as I have good or bad days of pain, I have days where I am more accepting or less. Some days, I’ll admit, I’m irritable and troubled by the most minor of discomfort. Some days, I’m pissed that I have to deal with this maddening, never-ending agony. Other days I am more tolerant, less frustrated by even extreme pain. When I compare myself today to where I was ten years ago, on my headache’s third birthday, I realize I have far, far fewer days of emotional anguish regarding my chronic headache. Overall, I struggle much less to handle it with grace and patience. Maybe the difference is time. It’s hard to hold intense anger towards the same problem for more than a decade. Or maybe the difference is that now I recognize the good things my chronic pain has brought. Sure, I’m sometimes grouchy. But I’m also a more authentic person than I used to be. I seek relationships with deep connection and hobbies and work that fulfill me more fully. I live much more in the moment and am much less concerned with external success. I also think about the change of course caused by becoming ill. Had I not developed chronic pain, I would have stayed in the Air Force. I wouldn’t have met many of the people who now form some of my most important relationships, including my husband. To honor this anniversary, I climbed Mt. 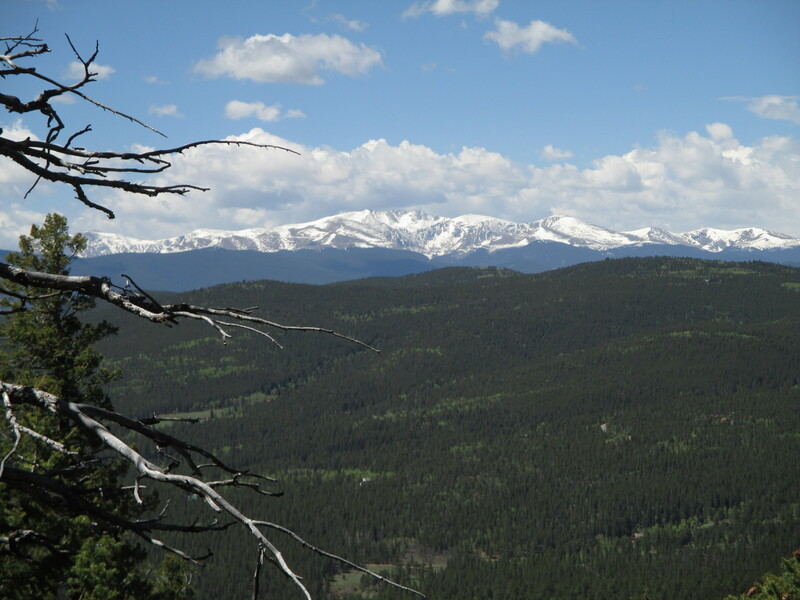 Elbert, Colorado’s tallest peak. My solo trek was a way to acknowledge the milestone, give myself time to reflect, while also celebrating how far I’ve come in overcoming this condition. Just like on birthdays people often think about what is to come in the next year of their life, right now I’m focusing about what I have the potential to experience, achieve, and celebrate this coming year, this 14th year of chronic pain. Thirteen candles on this 14,433’ foot-tall birthday cake. Mountain selfie. Happy birthday, headache. 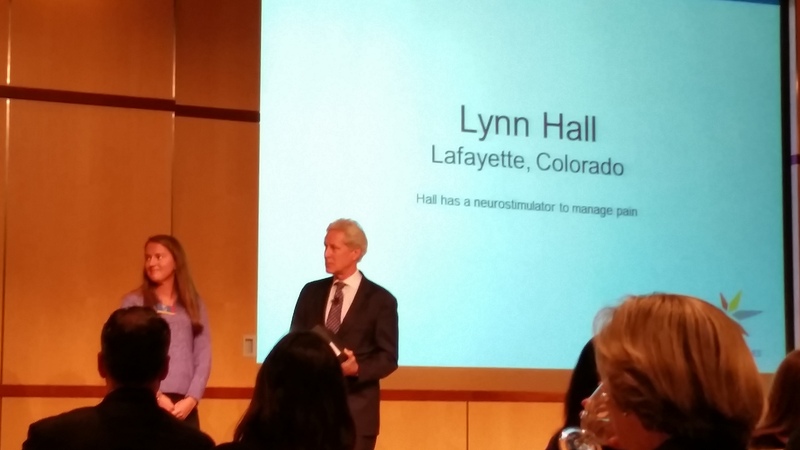 In my last blog about Medtronic Global Heroes, I wrote about meeting the engineers who designed my nerve stimulator. The other part of the experience that was, well, magical, was meeting the other 24 Global Heroes. I’m not sure what I expected of the program prior to flying to Minneapolis, but I know for sure I did not anticipate connecting so fiercely with the other runners. It is astounding to me that after three days, our bond is so strong that they feel like family. When I see pictures and videos of them, I sense a familiarity in their faces that I only feel with other friends after I know them for years or decades. On the surface, we all have medical conditions. And we all continue to run with the help of medical technology. But our connection is so much deeper than that: the other runners know what it is to struggle with a depleting, chronic medical condition. They know what it is to be in pain, to be fatigued, to sometimes spend hundreds of days in a hospital. They know how demanding an illness can be and how it sometimes requires constant maintenance and attention. They know how hard it can be to get off the couch and go for a run, how impossible it sometimes feels. Most importantly, the other Global Heroes understand why continuing to run with our medical conditions is so life-affirming, so healing. In the words of one of the other runners, we are all over-comers. To be honest, I didn’t expect to meet 24 strangers and like ALL of them so much. Here’s the thing about them: they are all ambitious, genuine, empathetic, mentally tough, and positive to the max. They set goals and reject limitations, they are authentic in their connection with others, they care deeply about their friends and family, they don’t let set-backs stop them, and they are so excited and happy to be doing life. I’m sure that when Medtronic read our applications, our essays and recommendation letters, they searched for runners with those characteristics as well as they could without meeting us. But I also think the fact that all of the other Heroes share those attributes is a testament to what it takes to overcome and thrive after a major life crisis. Maybe these are the traits that make someone resilient and able to achieve despite incredible hardships. It’s an honor to know the other Global Heroes, and they motivate me every day. During the times when I am too focused on my headache, I feel negative and drained, or I feel like skipping a run, I think of them. I think if they can do it, I can too. Every day I strive to be more like them. The kinship I have with my Global Heroes family is the greatest gift Medtronic could have given me. They inspire me, and I hope they inspire you, too. You can meet the other heroes here. 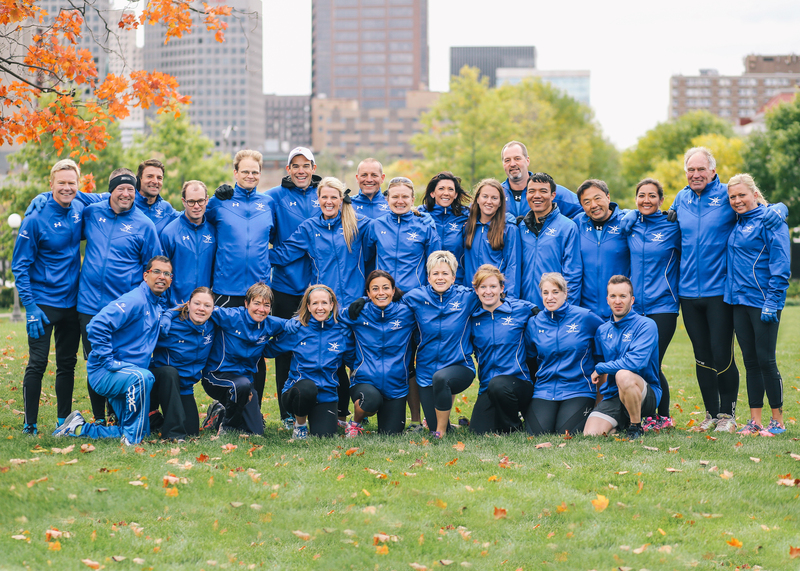 Several weeks have passed since I participated in the Twin Cities Marathon as a Medtronic Global Hero. I haven’t been able to write about it until now because the experience was so unexpected, so overwhelming, that I think I’ve needed time to process its deep meaning in my life. 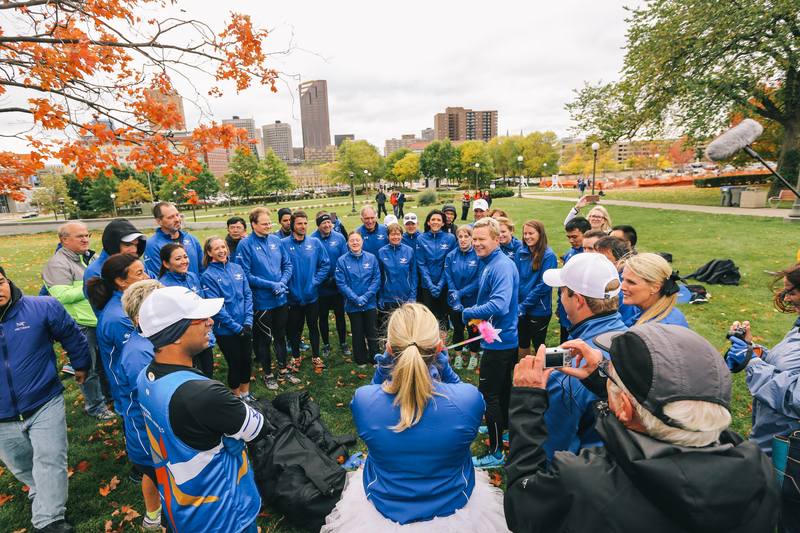 First, a bit about the program: Every year Medtronic selects 25 people from all around the world who have chronic medical conditions but are able to run because of medical technology. Some are diabetic who have insulin pumps, many suffer heart conditions and have artificial valves are pacemakers. A few have nerve stimulators to treat chronic pain, like me. 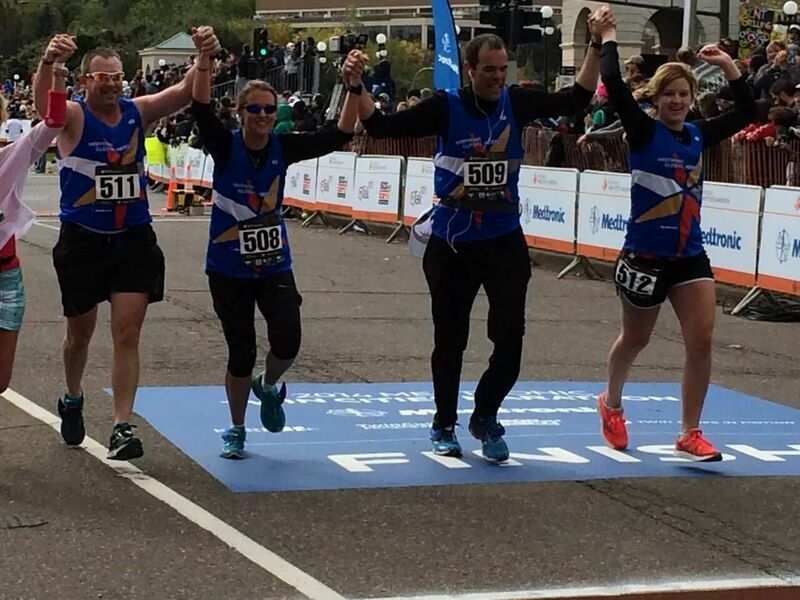 Medtronic then pays for those runners and a loved one to travel to Minnesota, meet the other Global Heroes, and run the Twin Cities Marathon. But really, the program is so much more than that. On our first full day in Minneapolis, (and after lavishing us with heaps of Global Heroes swag like apparel, water bottles, hats, a backpack, and more!) 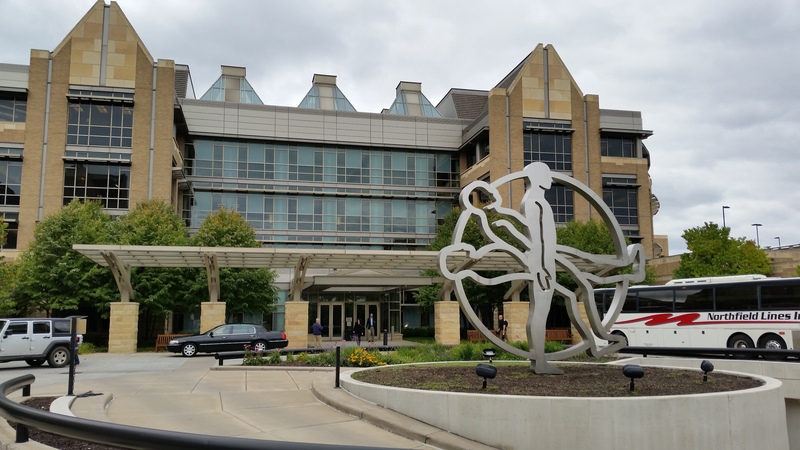 Medtronic gave us a tour of one of their main facilities. I was able to meet a few of the engineers who designed my peripheral nerve stimulator. In other words, the people who changed my life by plucking me up from the track I was on, a life of inactivity and inability to function, and set me back down on this new track in which I have opportunities and ability to fulfill my ambitions. The Medtronic Headquarters at Minneapolis, Minnesota. 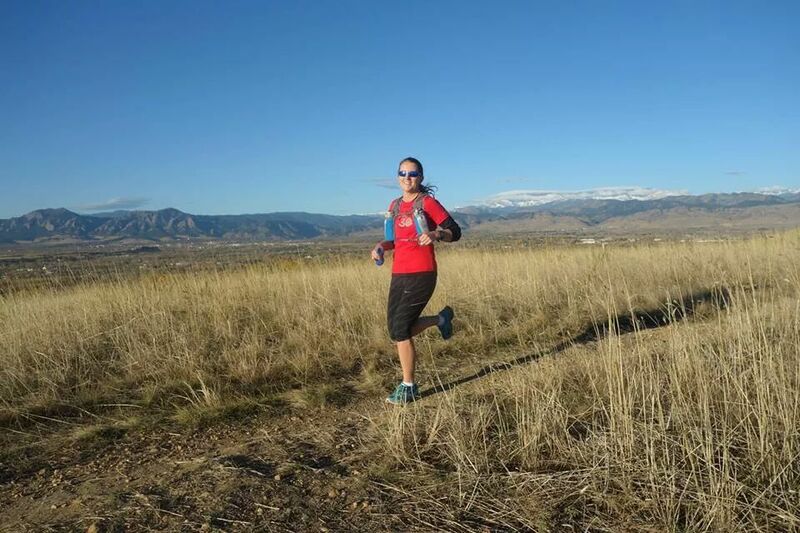 I often write about how ultra-running and mountain climbing lessen my physical pain and help me cope with what is left, but my nerve stimulator was the change that made it possible for me to be active again in the first place. Before my nerve stimulator, even going for a walk would aggravate my headache. I could never have become an athlete again without it. Listening to the engineers talk about the challenges they have in designing internal medical hardware, I have an entirely different appreciation for the amazing technology inside my body. Just as one example: I never before considered how much thought and innovation needed to be put into the type of coating around the outside of the device in order for my body to accept it. And that’s just one aspect, of thousands, of my stimulator. In 2007, I went in for surgery without ever having seen the device and came out having never met its designers. This was an opportunity to learn about the beginnings of my stimulator’s life cycle. The Global Heroes program removed the distance between the engineers and us patients and our loved ones, allowing us to come together to celebrate how much their medical technology has helped us achieve more fulfilling (or in many cases, much longer) lives. Medtronic read our stories to their employees and executives at an award luncheon. If my climbing trip has gone to plan, this morning I am making my way up the highest portion of Mt. Rainier, perhaps even standing on its summit. 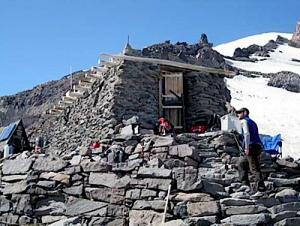 Yesterday, my team and I packed from Paradise trailhead to Camp Muir at 10,080 feet. 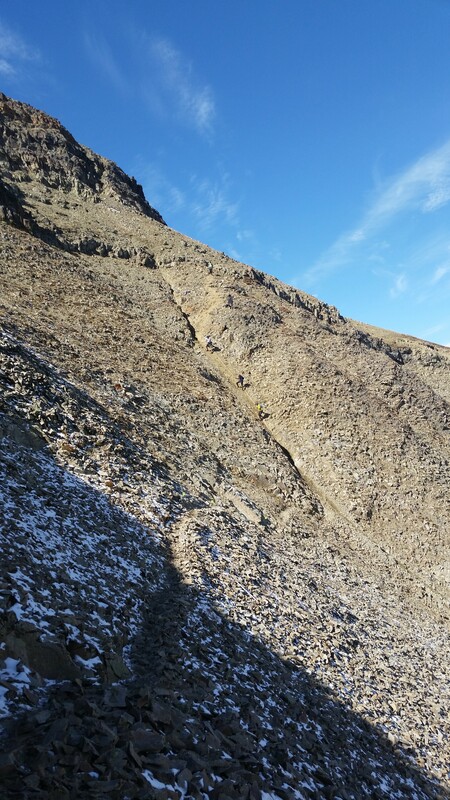 This portion of our climb should have been straight forward, requiring nothing more than trail runners (and considerable stamina to carry our overnight and technical gear). Last night we ate a hefty dinner, melted water for summit day, and went to bed early. Then this morning we roped up and began hiking at 1am to hopefully summit around sunrise. 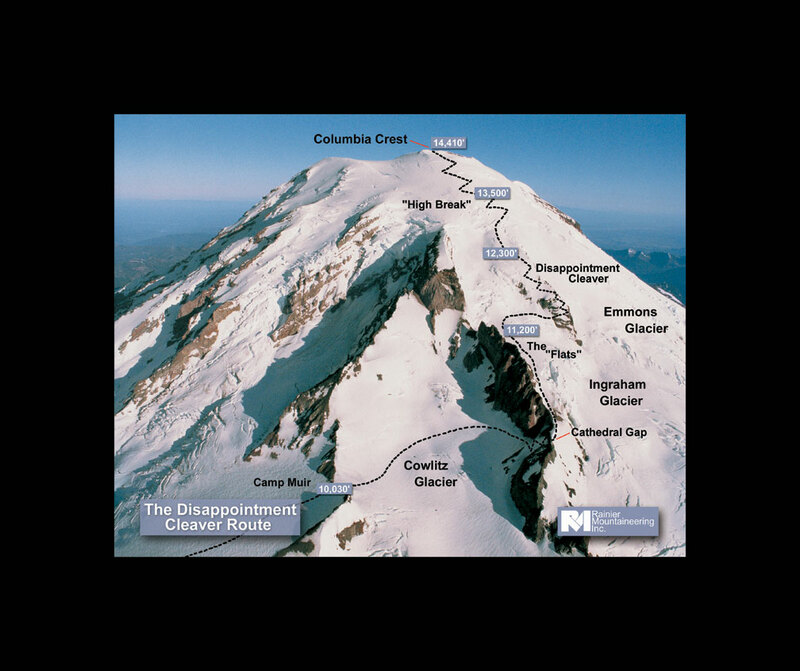 We let so early because we need to descend to Camp Muir before the sun warms the glacier, turning the snow too soft for safe travel. Thankfully, we had a full moon (assuming the night was clear). Thanks to WordPress’ handy scheduler, as this blog posts I will be in the air, flying to Washington to climb Mt. Rainier, my first non-Colorado peak. Whahoo! 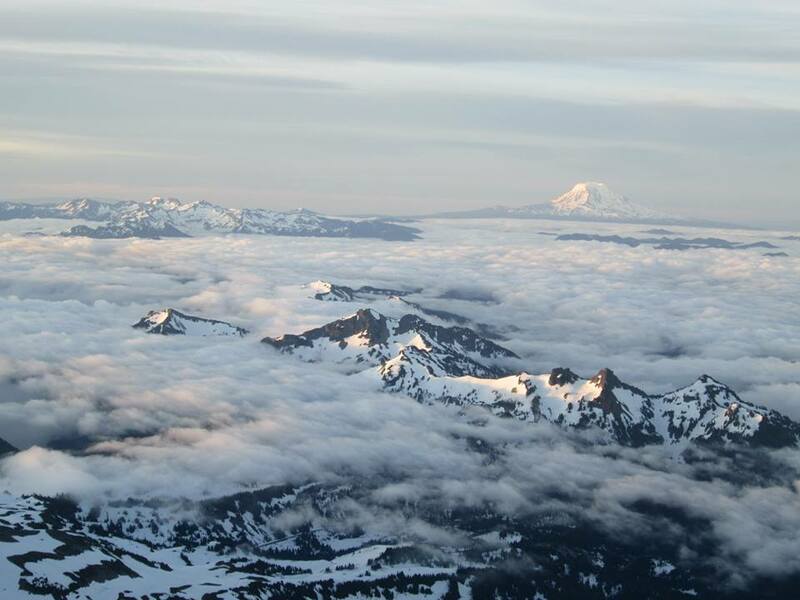 Mt Rainier (Credit: National Park Service) Yes, it is this snowy in the summer. My team will be climbing the standard DC route, the easiest and most popular. Over two days, we will climb 9,000 feet of elevation gain. 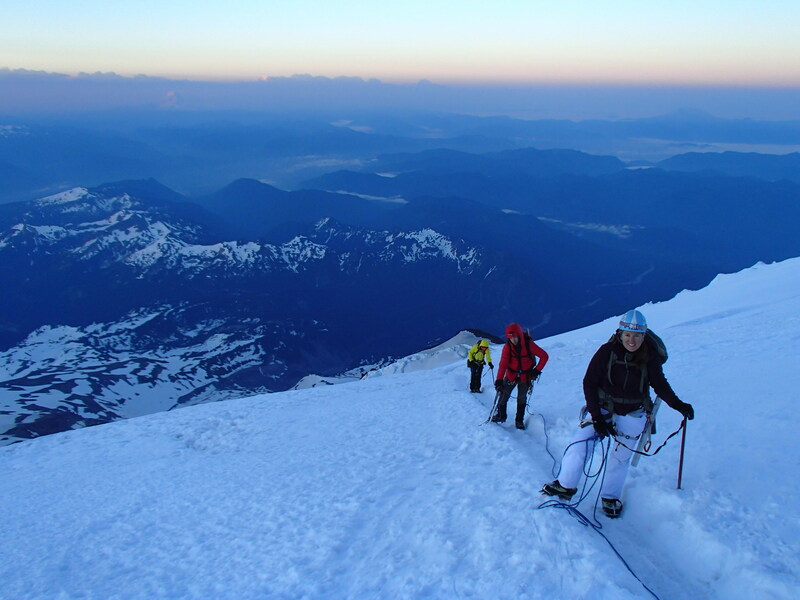 For the top miles we will be relying on ice axes, crampons, and a rope. The technical skills and endurance required are well within my capabilities. By far my greatest fear for the trip is about my headache. I’ve never before been in a situation where my headache became too severe on a difficult climb, but then again, over the last four years my headache has grown worse, so I can’t be sure it won’t happen this weekend. 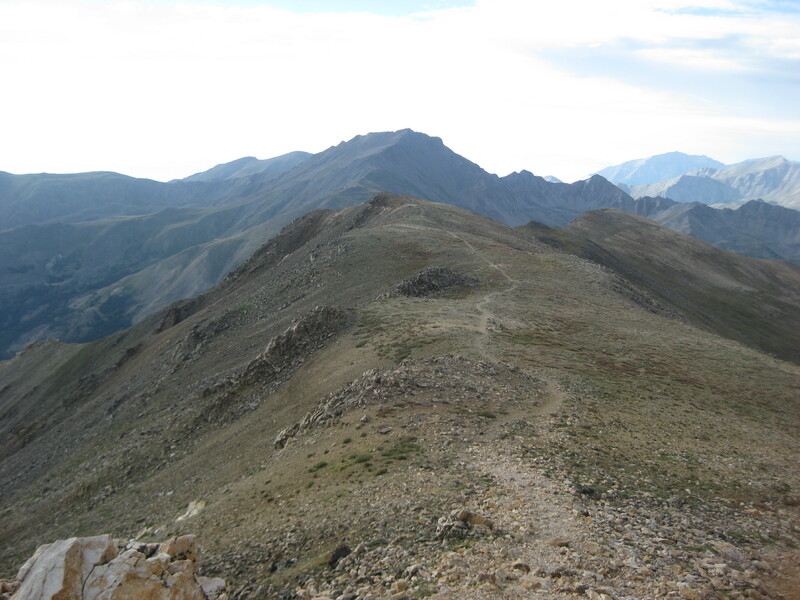 Certainly being on the top portion of the mountain with the nausea and dizziness that come with my most severe pain would be a bad situation. 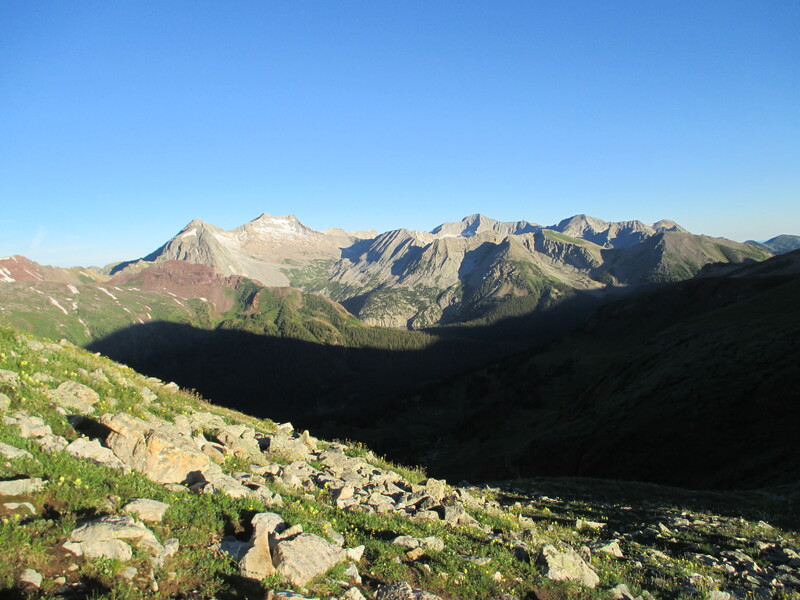 Three years ago, I had my closest call when a friend and I drove to Colorado’s San Juan range to climb two peaks, conjoined with a class 4 (nearly technical) traverse. As we hiked through the forest below the peaks, I had to tell him that unless my headache improved, we would have to turn around before the difficult climbing. Blessedly, or maybe just true to hiking’s healing nature, just as the sun rose and we transitioned from hiking on dirt to climbing on rock, my headache improved. This weekend the challenges with my headache will come partly from traveling. I’ve never before climbed outside of Colorado. The added logistical stress and change to my typical eating and sleeping routine could become a headache trigger. Then there’s the altitude. 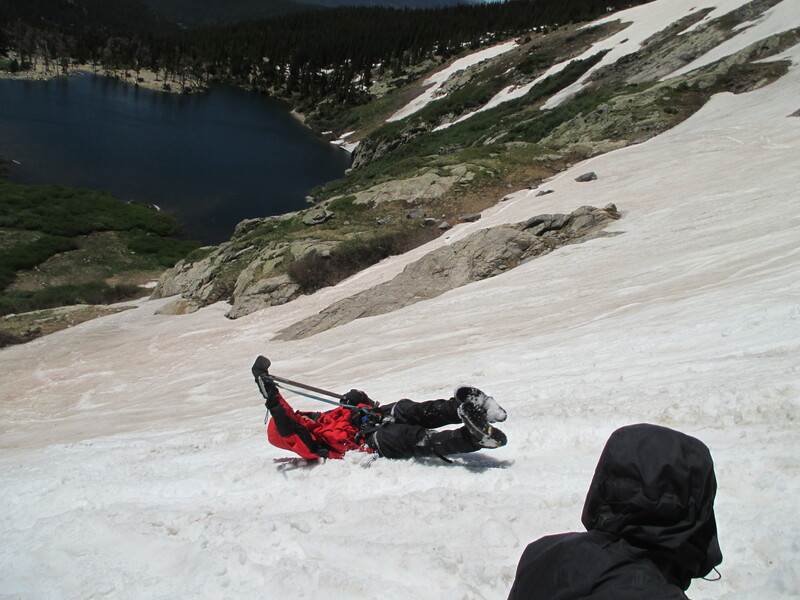 I’m well acclimated to 14,000 feet, and I typically do well with the decreased oxygen as long as I continue to move. But for this peak we have to camp. Once I stop climbing and adrenaline drains from my system, I might start to feel worse. I’m also worried about my pack. Carrying the required technical gear will add about 50 pounds to my shoulders, which can sometimes create enough tension in my neck to trigger a bad headache. It might also be hard to drink enough water and eat enough food given the mountain’s technical nature and the fact that I will be roped to three other climbers. 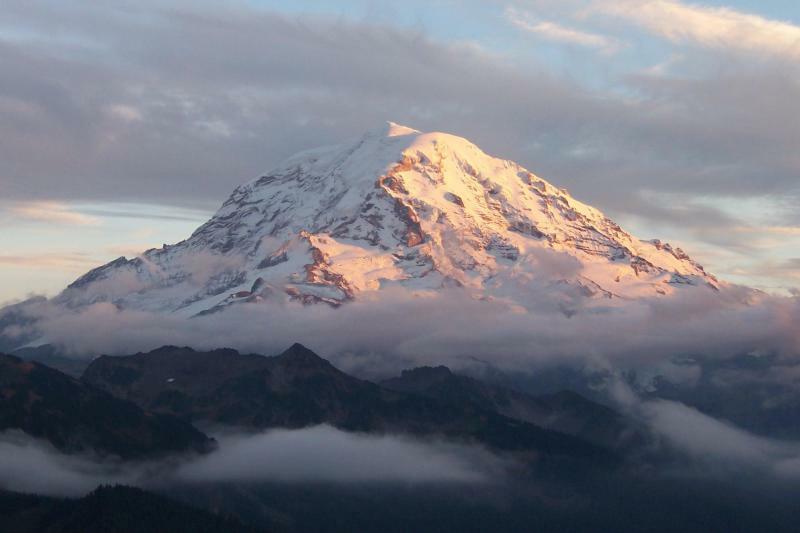 If it is too cold on the mountain (Rainier in the summer is similar to Colorado’s mountains in the winter, climate-wise) and I’m not able to sleep, that, too, can trigger my headache. This week as I’ve prepared for this trip, I have committed to being on my best headache-prevention behavior. I’ve run just enough to maintain endorphins (but not too much to come into the climb with tired legs), slept more than usual including naps, eaten clean and avoided foods that trigger migraines, drank plenty of water, visited my chiropractor twice, and fully charged my neuro-stimulator so that it won’t run out of battery on the mountain. 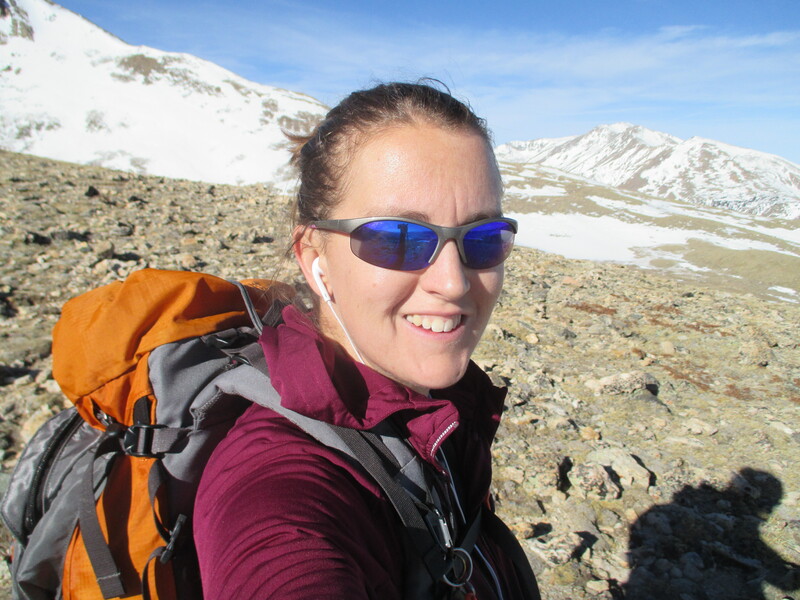 I also bought proper glacier glasses because so much of the route will be at altitude on snow (read: bright!). Hopefully the glasses will help my light sensitivity. Certainly Rainier will test my head’s limits. Climbing it is an act of faith that I have enough experience managing my headache and that climbing will continue to abate my most severe pain. I’d like to introduce you to my new friend and climbing partner, Zach. Zach and I have something exceptional in common: he and I both use climbing to control severe chronic pain. About nine years ago, Zach was standing near a tree when it was hit by lightning. Though he wasn’t directly struck, the current traveled to his feet, and since then his soles have felt as if razor blades are continuously shredding them. The pain has been so crippling that for many years he was unable to walk. What changed for Zach? About three years ago, he decided to stop taking pain meds. He says that change alone gave him approximately 30% reduction in pain. (I’ll save my rant on the perils of pain meds for another day.) With that modest improvement, he began to walk. Then exercise. Then hike and climb. Zach and I have talked about how difficult it was to begin exercising when, at first, it exacerbated the pain. How sometimes we have to push through harsh pain in order to reach the point where it helps. He also says that though he typically works out every day, if he doesn’t, he has about a week and a half window before the worst pain returns. I could hardly believe it when he said that – that’s exactly what my experience has been as well. I remember after my first marathon in 2011, I took a break from running. Within a week and a half, my headache grew far worse than I had experienced in years. By two weeks, the pain was so intense I could hardly show up for work. I hadn’t realized until then that running and climbing HELP the pain, not just my emotional state. Zach and I discussed how afraid we are of an unrelated injury or illness forcing us to be sedentary, even temporarily. We both fear aging and not being able to retain our active lifestyles. I find it fascinating that though our sources of pain are so different, the method we have found to cope with it is identical, and in many ways the experience of it feels the same. Sometimes I feel that because I am able to exercise despite my chronic headache, its severity is discounted, especially by other pain sufferers. (“Her pain can’t be that bad if…”) Yes, it is true that many types chronic conditions don’t respond well to attempts at being physically active. But for those of us who are successful, it doesn’t mean that it isn’t difficult. Continuously difficult. Meeting and connecting with Zach has given me the deepest sense of validation – he knows just how hard it was to become physically fit again despite the pain, and sometimes how hard it is to make ourselves continue to exercise. Zach also knows why I continue to push myself and how the benefit is greater than anything a doctor can prescribe. I’m so excited for my trip this weekend, not just to climb Rainier, but also to share the trip with someone who lives a similar journey. I did it! 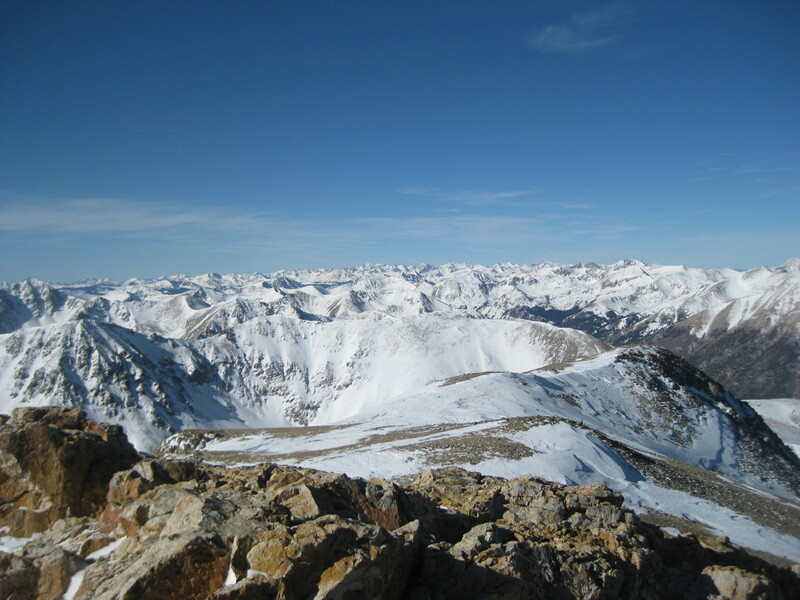 This weekend I hiked to my 100th Colorado 14’er summit. Yes, you are correct, Colorado only has 58 peaks above 14,000 feet, but since completing them all in 2012, I’ve returned to many of them. Immediately after summiting Mt. Belford, I hiked to its conjoined twin, Mt. Oxford, for my 101st summit. After a tough few weeks with my headache (see my recent post), it was rejuvenating to enjoy a day in the mountains with only minimal pain. Climbing my 100th and 101st 14’ers reminded me of the success I have been able to find despite my chronic headache. 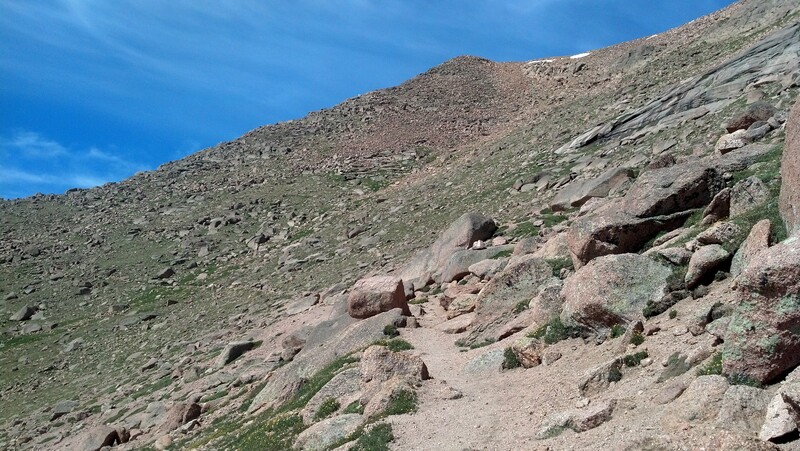 As I hiked, I thought of the many, many people with lifelong medical conditions who aren’t able to climb a 14’er even once, much less 101 times. Gratitude. That’s what I found in the mountains this weekend. 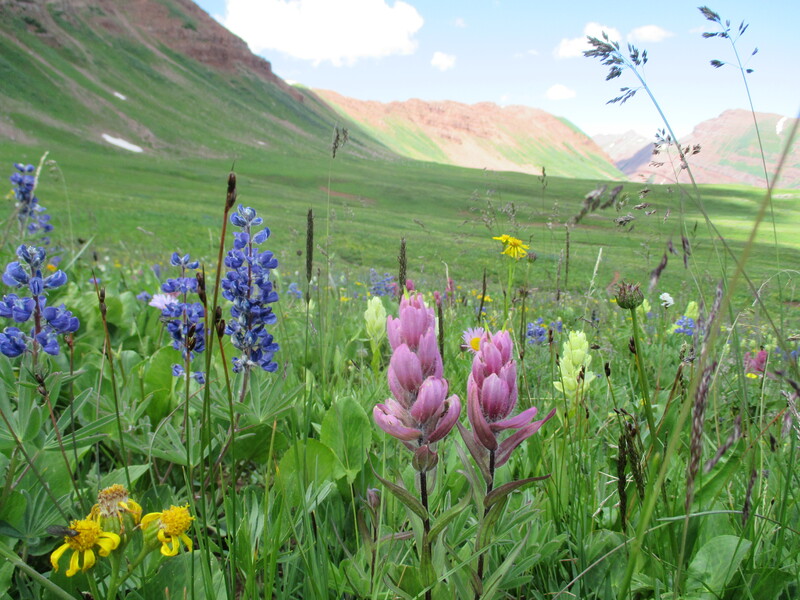 The Missouri Gulch in full summer (Mt Belford out of view to the left). Taken on my first trip to the basin, July 23, 2009. 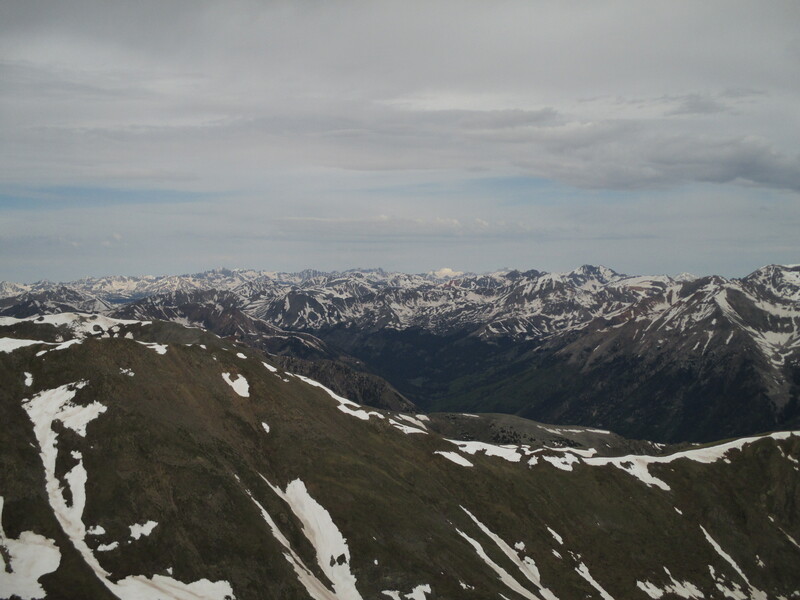 The view of the Elks from the summit of Mt. Belford, January 14, 2012. Spring conditions with quickly-melting snow this trip. From the summit of Mt. Oxford, June 21, 2014. 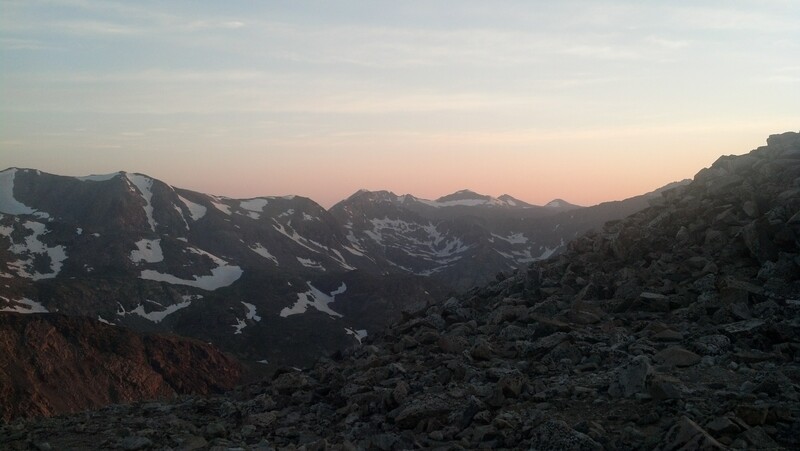 As I wrote about my disappointing Mt Evans Ascent the other day, I grappled with the grief I still sometimes feel surrounding my chronic pain. I realized that one of the most difficult aspects of a chronic medical condition is its on-going nature. Duh, right? The problem is that the losses accumulate. When I was 21, my chronic pain meant that I was discharged from the military and could no longer be a pilot. Then it took me five extra years to finish my undergrad. The pain has affected my relationships, too, including my 8-year marriage. I ended my last full-time job in part because I could no longer cope with both its demands and my pain. So when I experience another loss, albeit trivial – this time the disappointing finish of a race up Mt. Evans – it can re-ignite that heap of accumulating grief. I project the loss forward too. I worry about my August race up Pikes Peak. And then my September ultra in Montana. I worry about my professional goals and whether I will be able to meet them. I worry that the next time I have a brunch date with a friend my pain will keep me from connecting with her. I worry, and I worry, and I worry. All that anxiety can’t be good for my headache, can it? I suppose the only thing I can do – the only thing that any of us with a chronic medical condition can do – is, as they say, focus on the moment. Right now, I’m disappointed I couldn’t run up Mt. Evans in my goal time, in the time I know I’m capable. The trick is allowing myself to feel that loss without inviting the past, more-consequential grief to once again overtake me, and without catastrophizing my future goals either. I’ll let you know when I master this type of mindfulness.